When Dragonstar Rider equips an item, draw a card. 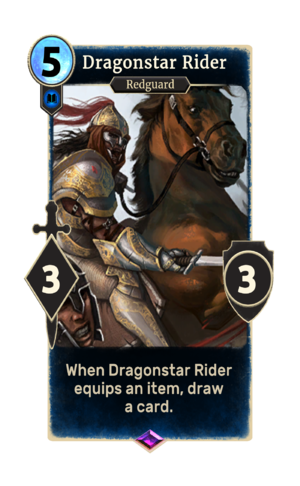 Dragonstar Rider is an epic Intelligence creature card. It is part of the Core Set. In addition to the card's availability in the Core Set, one copy is included in the Warriors of Hammerfell deck. "Swift as the desert wind!" "If I fall this day, may I eat sand." The card is named for the Hammerfell city of Dragonstar. This page was last modified on 16 February 2019, at 17:08.